On Saturday, the 26th of August, the US will celebrate Women’s Equality Day, which commemorates American women gaining the right to vote in 1920. It becomes even more intriguing when we introduce the fact that women are often better qualified than men. 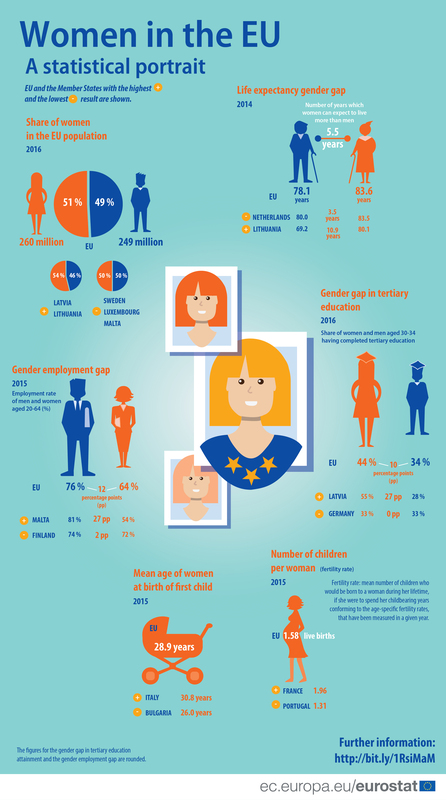 According to a Eurostat infographic, in 2016, the number of women aged between 30 and 34 with a bachelor’s degree was 44% whilst for men it was 34%. (Eurostat statistics about women qualifications). Gender discrimination is something that society has been trying to address. Companies are working to mitigate it. According to a McKinsey report about “Women in the workplace,” 75% of CEOs include gender equality in their top business priorities. (Women in the Workplace 2016 McKinsey report). Paradoxically, however, the same publication said that 45% of employees feel that their company doesn’t actually take any real measures to reach the goal of equality. Beyond corporate concern, governments around the globe have also begun working to address this problem. The European Parliament has been one of the leaders in this, introducing an extensive motion in 2016 about how they can empower women in the digital sphere. Several measures were then proposed such as tax incentives for companies that actually implement gender equality initiatives and various rules that address sexism and gender stereotypes. So far, the motion has been approved. (European parliament motion about empowering women in the digital area). Despite corporate and governmental work, the game changer for improving gender equality might actually come from an unexpected place: the digital world. Last week Forbes published an article about digital marketer Alaina Shearer. In her jobs she faced sexual harassment and gender discrimination and decided to found the organisation Women in Digital. No gender gap at ZN. Is it because of digital? Interestingly enough, the Huffington Post recently suggested that digital could be the key differentiating factor in closing the gender gap at work. The thinking was that investing in digital fluency could accelerate a woman’s career. In parallel, new research from Accenture found that if governments invest in digital fluency for women, gender equality could be achieved in 25 years in developed countries. With the way it stands now, it will take more like 50 years, however. The Accenture article goes on to explain that digital fluency doesn’t necessarily mean that every woman should be able to code. For Accenture, digital fluency is just the ability to post on social media, use an app or work remotely. In other words, these are day-to-day tools that can be easily learned but hold a vital place in a job environment. These tools enable women to work from home and manage better their family life with their professional life. (Is Digital the Great Equalizer When It Comes to Gender Equality at Work?). From apps to government motions, all of this work means steps are being made in the right direction. Until then, we work. Stick around for more updates and until next time, happy Women’s Equality Day!